This is what many of the finest restaurants use to keep their open bottles fresh. Wine lovers, preserve your favorite wines! Enjoy your wines, glass by glass, while a pressurized blanket of nitrogen protects your wines from oxidation. Now you can set up your own nitrogen Winekeeper gas preservation systems like the finest restaurants do. You can have an unlimited number of wines available for immediate dispensing. Customizing what you want is easy. It can consist of any number of bottles. Personally, Gizmo likes the 3 bottle “vintner” dispensers with lacquer finish (with room in the back to conceal the canister and regulator). It consists of a brass bottle holder, 3 Stopper-Faucets, regulator, disposable canister, quick-connects & tubing. The ultimate conversation piece! Operation is simple: uncork the wine, insert the stopper faucet, and serve. Unfinished bottles can be preserved by simply disconnecting the tubing and placing the bottle with its stopper in the refrigerator. Each disposable cylinder serves and preserves up to 25 bottles. You can also purchase a special adapter to preserve and pour large format bottles with the customizable Keeper System for larger display bottles (3L-6L). 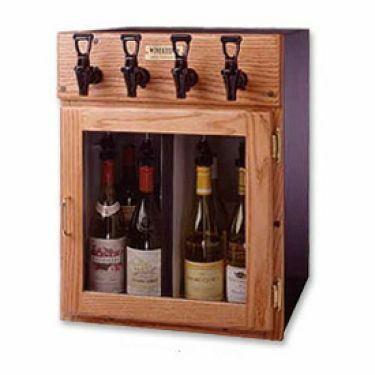 Winekeeper is also know for their beautifully crafted climate controlled Wine Dispensing Cabinets, Whether you chose the Napa, the Sonoma, the Mendocino or the Magnum Winekeeper gas preservation systems, you are getting the very best value in wine dispensing today. Additionally there are many custom finishes available to complement the look that best fits into your décor. For more information please call us directly at 831-722-2333. For prices please click on the picture below. Wine Accessories Unlimited will meet or beat any legitimate price you see on the internet today. We want to be your specialist for all Winekeeper Gas Preservation Systems.